Holland America Line has released the fifth Koningsdam “Countdown” video in a series that details The Dining Room. The short videos have been created to provide updates as the Koningsdam nears her April delivery. Hosted by Johnathan Rogers, Koningsdam’s inaugural cruise director, the fifth video in the series features Holland America’s Vice President of Guest Experience and Product Development Michael Smith, who takes guests inside the ship’s primary dining venue. The Dining Room was created by hospitality designer Adam D. Tihany, and is where the Koningsdam’s guests will dine for breakfast, lunch and dinner in a more formal setting. The ambiance of the two-story restaurant is described as sophisticated and airy, with several new features. The room features expansive windows that allow for maximum daylight and views of the water. In the evening the color turns to a darker shade of amber, setting the tone for a more elegant evening dining ambience. Structural ribs inspired by the strings of a classical harp connect the first floor to the second floor ceiling and create the sense of a more rounded, curvilinear space. A grand, curved staircase connects the two dining levels. The centerpiece of The Dining Room is a sculptural champagne gold wine tower designed to appear folded and fluid. This dramatic tower may entice guests to select a special bottle to enjoy with their meal, according to the cruise line. Flowing over the dining experience are chandeliers made from strings of tri-color, hand-blown glass bulbs. On the menu will be Holland America’s signature dishes, classic selections, regionally inspired cuisine and Culinary Council recipes from the chefs who compose the group, including the line’s Master Chef and Council Chairman Rudi Sodamin and chefs Mark Best, Jonnie Boer, David Burke, Elizabeth Falkner and Jacques Torres. Each “Countdown to Koningsdam” video features one of the ship’s officers or a Holland America executive who shares the ongoing developments onboard the line’s newest vessel, currently being built at Fincantieri’s Marghera shipyard in Italy. 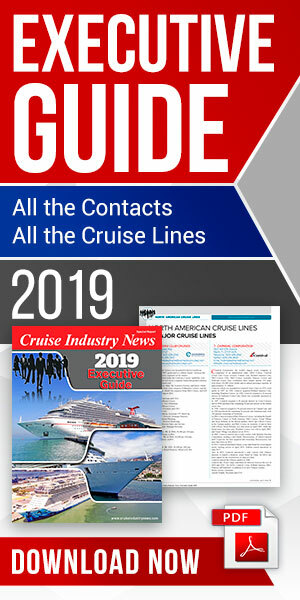 The video series is featured on the cruise line’s website. The first episode of the countdown to Koningsdam featured Hotel Director Stan Kuppens, who showed off the progress of the ship’s atrium, spoke about his move to the yard and what’s coming next for his team. Episode 2 featured Vice President of Deployment and Tour Marketing Linda Springmann detailing the ship’s inaugural sailing seasons in the Mediterranean, northern Europe and the Caribbean. “Episode 3” focused on the ship’s main theater, World Stage, and featured Director of Entertainment Bill Prince. The focus of Episode 4, featuring Deputy Director of Interior Operations My Nguyen, was on the ship’s staterooms and suites. Future videos include Captain Emiel de Vries talking about the Koningsdam’s recent sea trials; Kuppens discussing crew duties; Prince showcasing the Music Walk entertainment area; and Smith, who will reveal additional details about onboard dining.